Every dusty old arcade cabinet sitting in the corner of a pub or rotting in a warehouse somewhere was once shiny and brand new, assembled by workers on factory floors just like these. 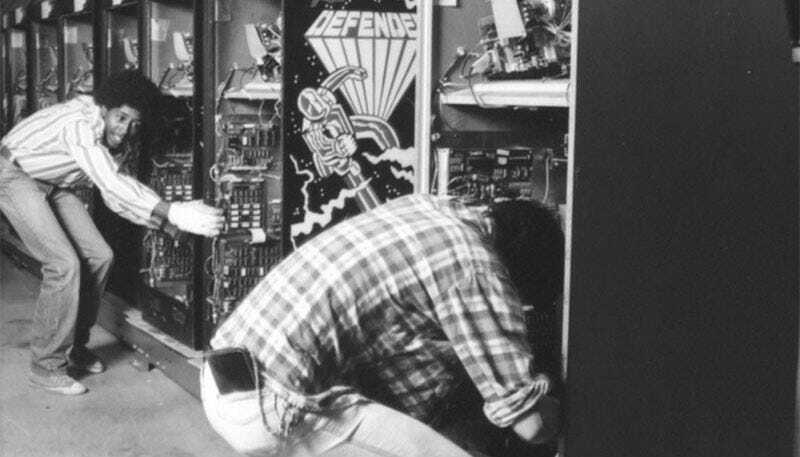 The Arcade Blogger has compiled a collection of old photos and videos of these production runs, showing how companies like Nintendo, Atari and Williams put their games together then shipped them out. And here’s a shot from Atari’s European factory at Tipperary, making cabinets that could be used on games like Asteroid and Missile Command. When we arrived at the plant, fresh off the plane , I was greeted by a room full of English engineers who, before even introducing themselves, asked sarcastically, “What makes you think you can do this any better than we are?” I said , “Because gentlemen, I am making 500 arcade machines a day in the United States and my boss told me to either make this place perform or turn it into a badminton court, so I expect you gentlemen to either work with me or go buy some badminton racquets and I’ll be on the next plane back”. Let’s just say they had an immediate change of attitude. You can see more shots from more companies and factories at The Arcade Blogger.